Given the recent media attention and continuing backlash against women gamers, journalists, and game studies scholars, this talk argues why gender, sexuality, and feminist critique matter in and for games and gaming culture. As media scholar Lisa Nakamura argues, “[M]uch of the pleasure of videogames comes at the expense of women and people of color, both literally and figuratively.” For example, the blogger of Not Quite Literally posted a provocation titled “World of Warcraft is Inherently Queer” arguing that the virtual space of games like WoW offer an “other” space where “the boundaries of gender [and sexuality] are expanded, eviscerated, and recreated into something entirely new.” Through a close reading and close playing of Zynga’s FrontierVille and Blizzard’s World of Warcraft, this presentation hopes to antidote the assumption that the virtual is “inherently” queer and to interrogate the ways that gender and sexuality in games is both subversive and normative. Sponsored by the Mellon Arts and the Common Good Grant and the Department of English at Drew University. 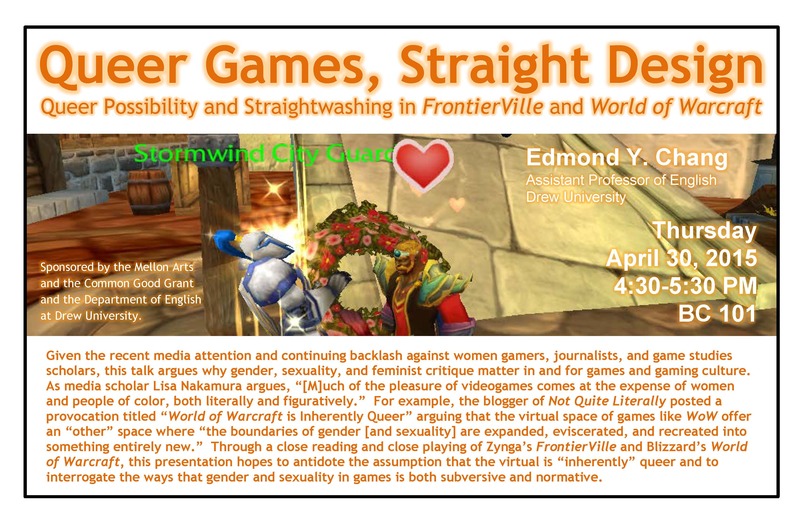 This entry was posted in #secondyearfaculty, Events, Gaming, Queer and tagged Frontierville, Mellon Arts and the Common Good, queer games, straight design, straightwashing, World of Warcraft. Bookmark the permalink.